A sales funnel, a.k.a digital marketing funnel, is the process of taking a person through the “buyer’s journey” – from prospect to lead to customer. Now, this entire process can be automated with a simple online sales funnel template. If you take a little bit of time and learn how to set up an automated sales funnel, your business will become completely revolutionized. Fear not though, we’ve got you covered. Keep reading to find out how to download our free sales funnel template and more importantly, how to use it. Nowadays, it doesn’t matter if you make money online, or if you have a physical shop or small office. In 2019, whether you’re an entrepreneur, coach, real estate agent, or dentist, to compete, you MUST leverage the power of reaching your customers online. Chances are, they spend most of their time on social media platforms, such as Facebook, Instagram, Twitter, Pinterest, Snapchat, Reddit, etc. However, you don’t have to be a social media guru to reach them. All you have to do is: get their attention online and bring them into your automated digital marketing funnel. Then watch as they go from a random person surfing the web, to your lead, and finally to your physical, in-the-door, customer. Offering them something of value is a great way to get their attention, before sending them to your sales funnel template. This will be discussed shortly. Whats Exactly is a Funnel? A sales funnel is a series of steps that turns your potential customer into a paying client. It walks them through the sale online, just like you would in person. It takes a person from being a random web surfer to becoming a lead, then a prospect, and finally a paying customer. A sales funnel template is helping you sell your product or service 24/7, even while you’re sleeping. If done right, it is possible to set up a truly “automated” sales funnel, where after the initial setup period, the funnel functions practically hands-off. This gives you time to work “on” your business instead of working “in” your business. 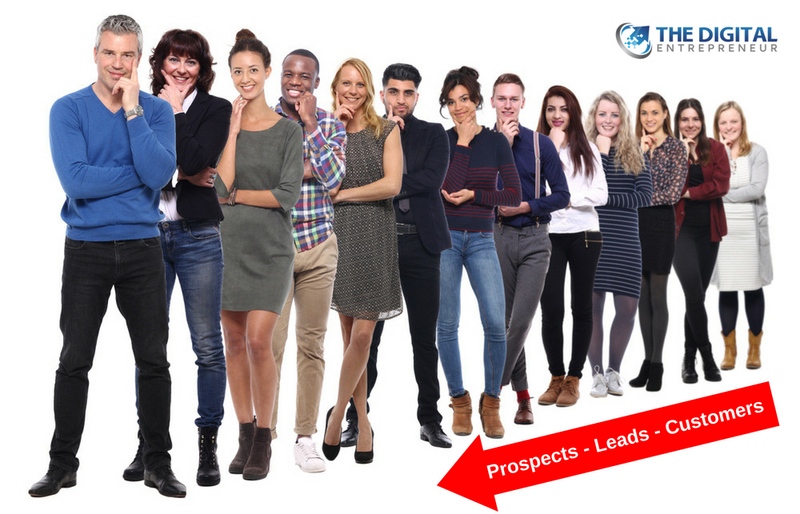 Wouldn’t it be great to have your leads come in daily on autopilot? 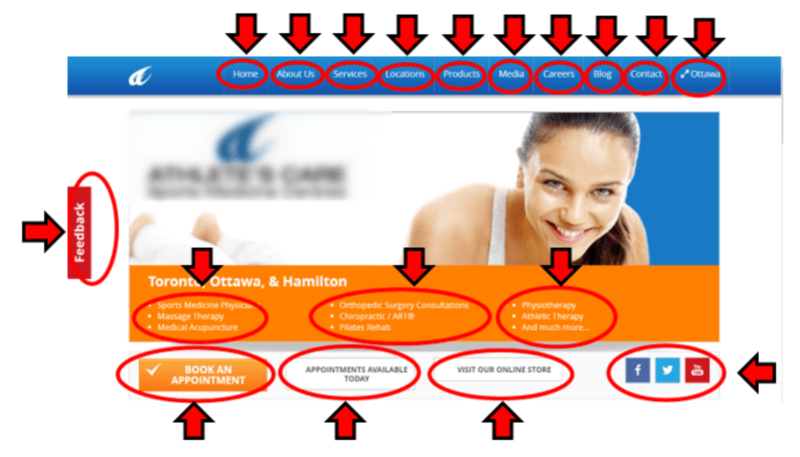 This is a typical website (home page) for a small business – a healthcare professional in this case. The red arrows and circles above represent all the possible places where a visitor can click, once he or she ends up on the website. I think you can see that it’s VERY easy for a person to get distracted on a typical website with a myriad of links and places to click (at least 18 links in the image above). Your website does have a purpose though. It’s great for someone who already knows about your business and wants to learn more. (They heard about you through word-of-mouth, a referral, or they found you on Google). Your website can serve as your “business card,” so no need to throw the baby out with the bathwater. 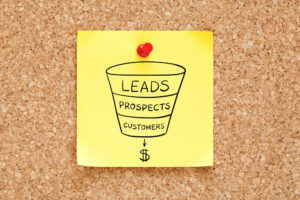 However, when you are trying to get brand new clients online, those who are unaware of your product or service, and you want to get NEW leads daily, you need a dedicated sales pipeline template that is designed to collect people’s information and turn them into leads, prospects, and customers. Now, let’s take a look at a simple 2-step online sales funnel template that we created for one of our marketing clients, a local small business owner/chiropractor. Don’t be fooled by it’s simplicity, as it outperformed a conventional website in every single A/B test we ran. This funnel has 2 parts, the first of which is called a “landing page,” the page a website visitor first “lands” on. A successful landing page should accomplish several things. First, it should provide something of value to a customer, in exchange for their personal info (name, email, phone number). In this case, it’s a $25 voucher for a 1-hour initial examination with a chiropractor. An initial examination can be worth anywhere from $50 to $200 and for someone who is having pain, $25 sounds like quite the bargain. Take a look at the red arrows once again. Did you just have a “eureka” moment!? Do you see just how much MORE effective a sales funnel template is at “funneling” the person to click where you want them to? If someone arrives to your site from Facebook, or another social media platform via an ad or offer, which site do you think will be more effective at keeping their attention long enough to become a lead? 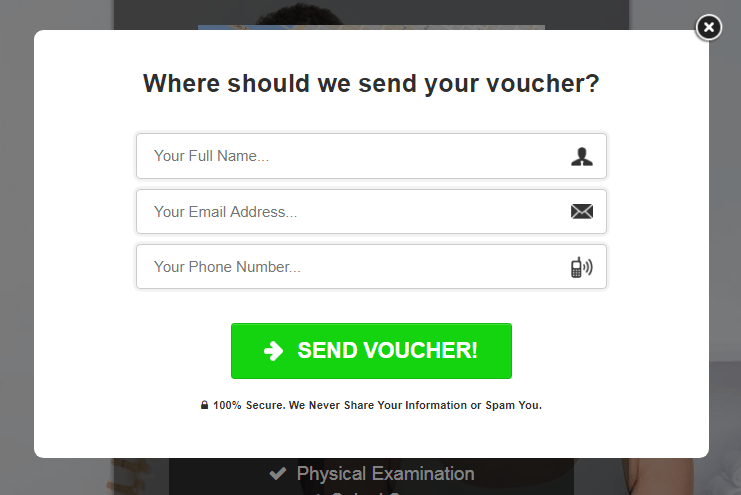 In order to receive the $25 voucher, the person has to enter their full name, email address, and phone number. Once they do, they receive an automated “welcome email” with the voucher attached. More importantly, the person now becomes your lead and their info is sent directly to your phone. At this point, you or your staff can email them directly or call them to follow up and book an appointment. So your digital marketing funnel visitor just became a lead, and now you have all their precious information. You now have a chance to gently entice your lead to follow through and book an appointment. This is done with a “thank-you page,” a page that a visitor lands on after they have filled out the input form above. At this point, you can offer them a further discount (or freebie) if they act now, or within a certain time period. In this case, we got our client to make a 1+1 offer with a free visit for a family member or friend. There’s also a countdown timer to create a feeling of urgency and to entice the prospect to act ASAP. Notice that there are also “call” and “email” buttons, for the leads who are proactive, and want to contact you themselves to book an appointment right away. For the rest, you have all their personal information and can email or call them when you so desire. This is the same type of simple-yet-powerful 2-step online sales funnel template we saw before. This time the input form is embedded right into the landing page. 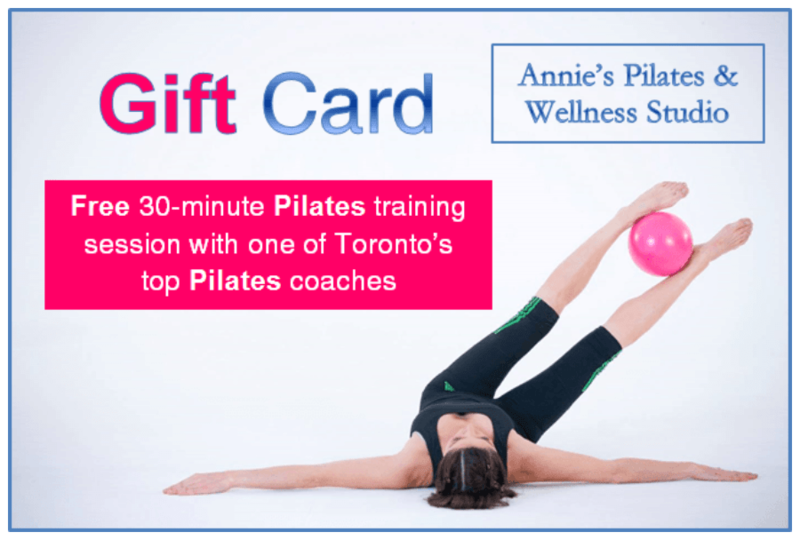 Here, in exchange for a person’s personal info, we are offering a free gift card for a 30-minute pilates training session. The second page of this funnel, the thank-you page, simply thanks the person for registering and lets them know that a copy of their gift card is on its way to their inbox. It also provides call-to-action buttons (call now/send email) and a similar 1+1 offer for a friend or family member if booked within 24 hours. See below. The two real estate landing pages are very similar, except for the background pictures, and the input form embedded into the second landing page. A person who is looking to buy or sell a home will want to read a report of this month’s real estate trends in their area. Parting with their name, email, and phone number is a small price to pay! Please don’t feel that you must always offer a “market report” as your special offer if you’re a realtor. Try getting creative. A realtor can offer other things, for example a “List of Homes for Sale Under $X in Y Area.” This would be a great special offer that would entice someone looking to buy/sell a home to visit your sales funnel and get this list in exchange for their details. In fact, almost every single type of product or service-based business out there can use this simple 2-step sales funnel template that collects leads. All you have to do is think of something of value that would make a person want to visit your site, and enter their personal details in exchange for. This is your special offer. The special offer (also called “bait” or “lead magnet” by marketers) is the cornerstone of your funnel. This is a free or low-cost offer which you advertise online and use to bring visitors into your digital marketing funnel. When creating your special offer, please don’t be scared to give your services or products away for cheap (under $30) or even FREE (free works best actually). Now, you may wonder, how is my business ever going to make money by giving away such discounted or even free services and products!? By making your introductory product or service, free or cheap, you are maximizing the number of people that enter your sales funnel. After you provide awesome value for free/cheap on the initial product (your special offer), your customers will be much more receptive to buying more expensive and more valuable products from you. 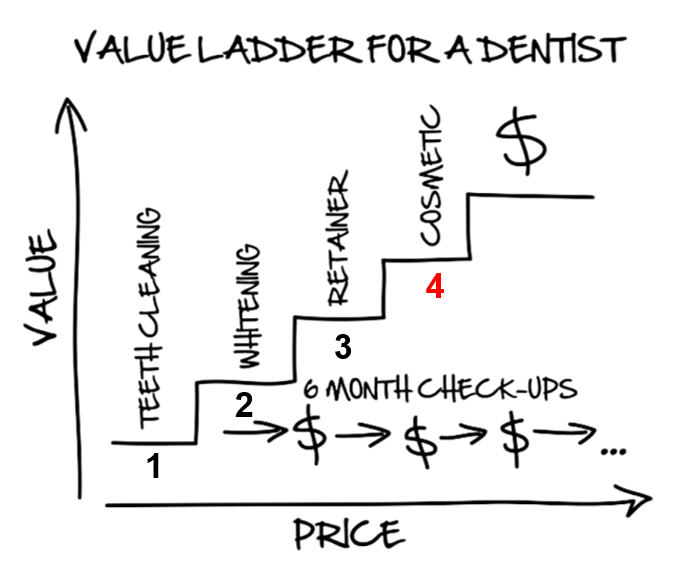 A value ladder is simply 3 or more products that your business offers, each with a different price point and value to the customer. For example, if a dentist offers a “free teeth cleaning,” as his special offer, he will not lose money. On the contrary, he will make tons of money from the patients who also need teeth whitening, retainers, and cosmetic surgery. Your job is to seamlessly guide your customers up the value ladder, providing services with more value at each step, which your client is more than happy to pay more money for. The concept of the value ladder is taken from “DotCom Secrets,” a brilliant book by Russell Brunson, one of the most innovative digital marketers of our time. We would highly recommend it to anyone who wants to take their business to another level. All 3 of the sales funnel templates featured in this article (healthcare, real estate, and fitness niche) were created using a software called ClickFunnels, each under 20 minutes. ClickFunnels is an easy-to-use, fun, and user-friendly sales funnel builder. It lets you select from a variety of ready-made templates of landing and thank-you pages. For our in-depth review of ClickFunnels, please read this post – Official ClickFunnels Review for 2019. To download our free sales funnel template, please read below. 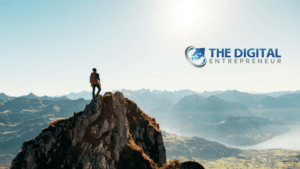 Enjoy your free funnel and stay tuned for the next article about improving your business, making more money online, and being a digital boss!